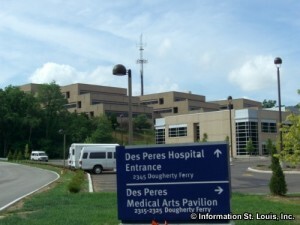 Des Peres Hospital, a member of the Tenet HealthSystem, is an acute care general hospital with all private inpatient rooms. They have served the residents of St. Louis and surrounding counties since 1974. Their Emergency Department is open 24/7 and is equipped to handle a wide range of emergencies-from appendicitis and tonsillitis, to broken bones and heart attacks. The hospital provides quality medical and surgical care through a wide variety of services and programs, including senior care, heart care and orthopedics. Health Grades, a health care quality ratings company, ranks Des Peres Hospital as number one in Missouri and among the top five percent in the nation for joint replacement surgery, and number one in St. Louis for overall orthopedic services for 2006. Des Peres Hospital is accredited by the American Osteopathic Association's Healthcare Facilities Accreditation Program. Des Peres Hospital's Acute Care for the elderly unit puts older seniors under the care of specialized, multidisciplinary team devoted to minimizing the adverse consequences of procedures, tests and medications, and to maintaining the patient's function levels in order to reduce the length of stay in the hospital.